“We cannot be of the least assistance to the trade unionists of the Coast by going out on a strike,” Coates said. While he acknowledged the plight of the shipyard workers in Puget Sound, he said conditions in Spokane were far different – and far better. He said Spokane’s trade unionists have had a year of “peace and harmony” and general advances in wages and working conditions. Meanwhile, tensions were building in Seattle. About 55,000 workers were still on strike, but more cracks were beginning to appear in union solidarity. The streetcar men of Seattle’s Puget Sound Traction, Light & Power were rumored to be returning to work soon. Streetcars in Tacoma were up and running. 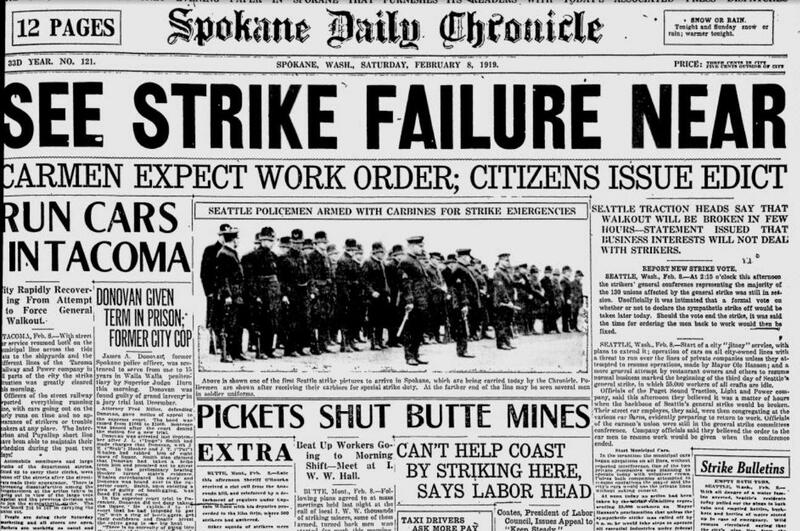 Mayor Ole Hanson said he would begin operating all of the city’s essential services “under federal protection” if the unions did not call off the strike. A meeting of the strikers’ general conference was announced, and there was a possibility of a vote on whether to end the strike.